They said if a person had to kill, gut, clean and prepare their food — everyone would be a vegan. Although that argument sort of collapses when you consider that butchers and hunters do that exact process all the time and seem to have no problem consuming whatever meat they bring back. Perhaps they’re desensitized, or maybe it’s that us vegans are simply over-sensitized to eating another being’s flesh. I became vegan solely for health benefits — in fact when I made my decision I didn’t necessarily care about the well being of animals. However after watching the documentary Earthlings (narrated by Joaquin Phoenix, soundtrack by Moby), I realized that all animals are just trying to survive and live a happy life on this planet, and the fact that humans prevent this on a large number of animals is simply speciesism. Yeah, just like racism and sexism — speciesism are privileges assigned solely based on a specific species, which in this case would be humans. One day far into the future humanity will look back on this time and consider eating a meat the largest genocide the planet has ever seen. Unlike animals that are natural carnivores, humans have the unique privilege of choice and free will. There’s no reason why every person on this planet shouldn’t be a vegan — it’s a person’s conscious decision to consume flesh. 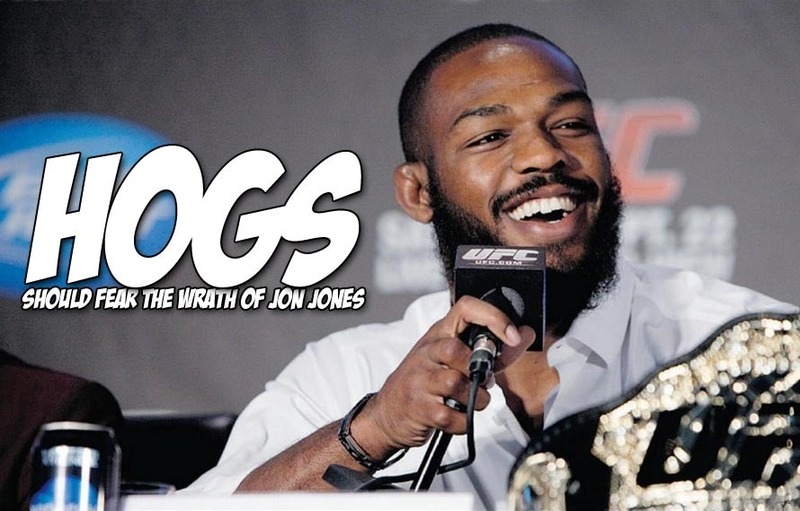 No one is holding a gun to your head, unless you’re a wild hog, then Jon Jones is holding a gun to your head, and he’s likely going to shoot you, as illustrated in this photo. Props to Tito Couture for the find.